We're pleased to offer a residential composting service to the Charlottesville, Crozet, Waynesboro, Staunton and Harrisonburg areas. It's a great solution for those looking to compost at home, but don't have the backyard or time. Beyond just a recycling service, this is about building a cleaner community, keeping this valuable resource out of the landfill and returning it to local farms and gardens to grow more plants and food. As part of the service, we offer our members free finished compost for use around your home or to donate to a community garden of your choice. Looking for even more compost? As a member, we'll give you discounts on bulk compost available only to members. 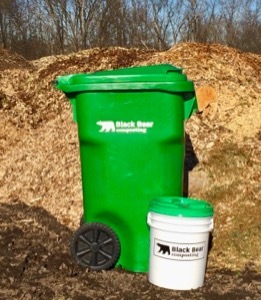 Small – For those interested in just composting food scraps, choose our 5 gallon sealed bin. We will collect it on a weekly basis and give you 5 gallons of compost/month. Perfect size for apartments, condos and town homes. Subscription Price: $21.25/month, plus a one-time new member fee of $21. Large – Also have yard waste to compost? Choose our 65-gallon wheeled bin for your food and yard waste. We'll pick it up every other week and provide 10 gallons of compost/month. Subscription Price: $24.25/month, plus a one-time new member fee of $24. We don't ask for a long-term commitment. You're welcome to cancel your membership at anytime, but think that you'll love composting with us. Complete the form below to give us your contact information and we'll follow up to set-up your service. Please help us reduce spam by answering the question to the right. Sorry, please answer this question. Don't live in one of our service areas (Charlottesville, Crozet, Staunton, Waynesboro and Harrisonburg), but are interested in our residential services too? Go ahead and fill out the form anyway and we'll see what we can do.